VANCOUVER — Recycling in the city of Vancouver is about to get a bit more expensive. Members of the Vancouver City Council voted unanimously this week to approve a new contract with Waste Connections of Washington, which handles garbage and recycling collection. In addition to extending that deal, the council approved a set of rate increases due to go into effect April 1 of this year. The increase comes as Clark County is expected to implement similar rate hikes to offset the rising cost of processing recycled materials. In the wake of China’s decision to cease buying nearly all recycled waste from the United States due to increased contamination, companies that process the materials have seen costs rise rapidly. West Van Materials Recovery Facility, which deals with most recycled waste in Clark County, has had to slow down sorting machines and hire more people to look through materials coming in and pick out things like plastic bags, and food waste. Clark County is expected to approve a new processing fee of $68.91 per ton of recycled materials for Waste Connections, with most of the added cost being passed to customers. Waste Connections has said rising costs had eaten into the bottom line to the tune of $4 million over the past two years. The increase for Vancouver residents will begin April 1. 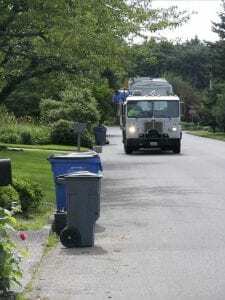 An average household with a 32-gallon garbage can and every-other-week recycling pick-up can expect to see their bill rise by 8.8 percent, or an average of $1.96 per month. For multi-family complexes, the average cost is expected to increase by around $0.78 per month. Customers will see the increased rate under a “recyclables processing surcharges” line item on their bill. As a trade-off, Waste Connections will no longer offer on-call yard debris pick-up once the new organics program is in full effect. With Vancouver focusing more on mixed-use developments, space can be at a premium for garbage collection. Developers have complained that having a large trash bin and weekly pick-up in a densely populated area greatly affected liveability. To address that, the new Waste Connections contract introduces what are being called “space saver” rates and daily pick-up, including Sundays. Waste Connections says they expect the space saver rate to apply to 10 percent of their Vancouver customers. They’re expected to offer an average of 14 percent savings over regular container rates, but businesses will be asked to pay a 10 percent premium (embedded in the rates that were adopted) over rates for larger containers with less frequent pick-ups. To offset the cost, Waste Connections will increase commercial container rates by 0.5 percent beginning January 1, 2020. Over the past 10 years, Vancouver worked with Waste Connections to implement and expand a population commercial recycling program by fully subsidizing recycling service with carts, or up to a 3-cubic-yard container at a cost of $26 per month for each business. Under the new contract, the subsidy will decrease to $15 per month, with businesses asked to pay the $11 balance, should they choose to continue the program. That fee is flexible during the year, depending on market fluctuations and material processing costs.